Canon PIXMA iP6220D printer : Canon announces the addition of a new high-speed photo direct printer to the Canon PIXMA line-up: the PIXMA iP6220D. The stylish printer features cutting edge FINE (Full-photolithography Inkjet Nozzle Engineering) print head technology for fast, superb quality photo prints. With a host of in-built photo enhancement features, the PIXMA iP6220D can print direct from a range of sources: popular memory cards, PictBridge compliant digital cameras or mobile phones using a built in IrDA port or optional Bluetooth adaptor. The personal photolab features high speed direct prints, Exceptional 6 ink photo quality, LCD displays to aid printing without PC and long lasting photos. "This new range of photo direct Canon PIXMA printers confirms Canon's commitment to driving the rapidly developing personal photo printing market," said Mogens Jensen, Head of Canon Consumer Imaging Europe. "The print quality, connectivity and speed advantage of these printers will secure the PIXMA brand's success." New FINE Cartridges for the Canon PIXMA iP6220D printer have a significantly lower profile than previous PIXMA generation technology, paving the way for the new low profile design. Direct printing is supported with a range of built-in image enhancement features, so photographs can be improved without resorting to the PC. Red-eye Correction automatically detects and corrects red eyes caused by flash reflection, while the Face brightener can distinguish and increase the brightness of faces when they are in shadow. 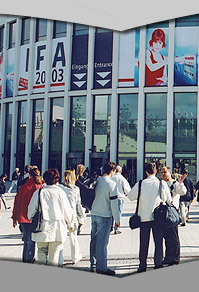 Prints of low-resolution images, such as those taken on a camera phone, are optimised with the Image Optimiser function, softening jagged outlines and reducing JPEG block noises. Wireless printing from Bluetooth compatible camera phones is available with the optional new super compact BU-20 Bluetooth adapter, which plugs into the printers' PictBridge port. 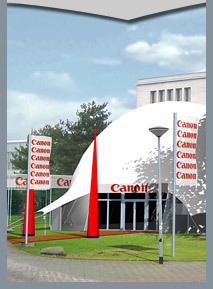 Canon's patented FINE semi-conductor manufacturing technique creates extraordinary print speeds by producing exceptionally long print heads with exceptionally high nozzle numbers and density. These get more ink on the page in less time than is possible with traditional ink jet technology, delivering fast borderless photo prints up to A4 size. FINE also achieves virtually grain free photolab quality by delivering millions of microscopic picolitre droplets each second with extremely high consistency and accuracy from Micro-Nozzles. Canon iP6220D printer : For improved fade resistance, each printer supports Canon's new ChromaLife100: a system of genuine Canon dye-based inks, which deliver exceptionally broad colour gamut, and specialised photo paper designed to work together with FINE print heads. This technology 'triangle' of nozzle design, ink and media produces prints that rival silver halide quality and longevity. Prints resist fading for 100 years when album-stored, 30 years when displayed under glass and 10 years when exposed to the effects of the air. Canon's competitive advantage in printer hardware technology is fully realised when genuine Canon photo grade media and inks are used. The diverse and growing range of Canon media, including the new affordable Glossy Photo Paper Everyday Use (Canon GP-501), is developed specifically to work in combination with Canon's FINE ink jet print technology. Photo papers and media are available in a wide range of sizes (from credit card to A4), formats (including mini stickers) and finishes (from matt to semi-gloss to super-high gloss). They include double-sided photo paper (Canon PP-101D 13x18cm and Canon PP-101D A4) and the flagship Photo Paper Pro (Canon PR-101) for the highest grade, ultimate durability professional results. As well as working direct with input devices such as digital cameras, memory cards and camera phones, all printers work seamlessly with PC and Macintosh computers. A comprehensive suite of photolab software includes Easy-PhotoPrint for simplifying photo prints, Easy-WebPrint, PhotoRecord for creating albums, CD-LabelPrint and Easy-Print Toolbox to keep all applications together in a single menu bar. 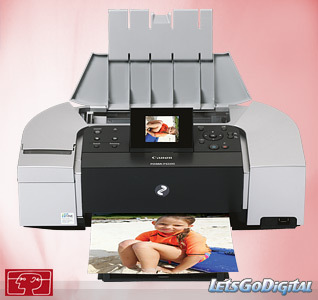 The new Canon PIXMA iP6220D printer is compatible with Windows 98/Me/2000/XP, and Mac OS X v10.2.1 or later.